This topic describes how the training material is organized, ways to navigate the material, the search engine and text conventions. Each module contains a collection of topics or lessons for the course. Clicking on the book will expand the book to display a list of topics contained in the book. You will find there are cases where books are nested in a hierarchy. You can click on any book to expand the list of topics. Clicking on a topic will open the topic in the main window pane. You can zoom in on the current topic with the shortcut key Crtl+= (the Control key in combination with the += key), and zoom out with the Ctrl-_ key (the Control key in combination with the -_ key). You can also zoom using the Ctrl key and a mouse wheel. The search box is located in the upper right hand corner and allows a convenient way to search the training material. The search algorithm uses a full substring search, which means that the search results will match any word which contains the search criteria. Search results within each topic are highlighted with a yellow background. For example, searching for jump will match both the word jump, and the substring jump in jumper. You need to provide at least three search characters, as search terms with less than three characters are ignored. The search algorithm uses OR logic; that is, each word in the search field is OR'ed with the previous word. For example, searching for jump pop finds all topics which have matches for either the jump or pop keywords. Search results are shown in a new page. The search algorithm uses Stemming, a system where search terms are reduced to their English root before being passed to the search algorithm. For example, jumps and jumped are reduced to the English root word jump before searching. The root word, not the original search term, is highlighted in the topic which matches the search. Open the schematic titled 1.1_SelfOscillatingConverter_POP_AC_Tran.sxsch. Click on the Help Button in the lower right corner of the dialog. 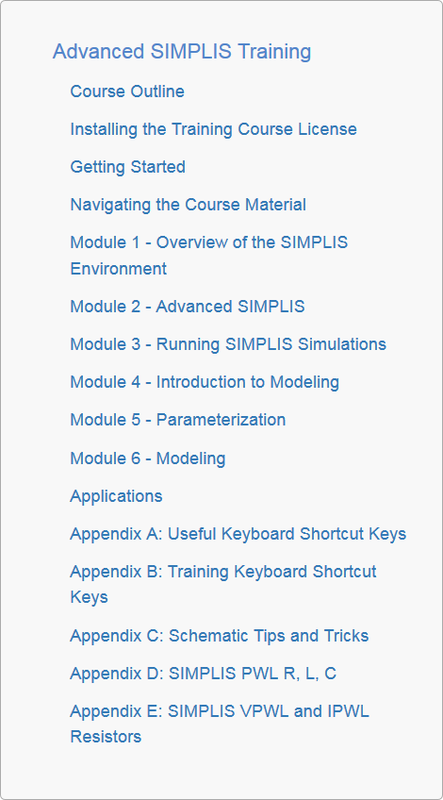 Result: The Help system opens to the SIMPLIS MOSFET Models topic. Note: The shortcut Shift+S will execute the same menu item. When you copy a schematic by using the File > Save Schematic As... menu or by copying and pasting in a Windows Explorer window, the F11 window contents are also copied. Keep this in mind, as the original schematic may have F11 content which is not needed, or worse, is detrimental to the new design.